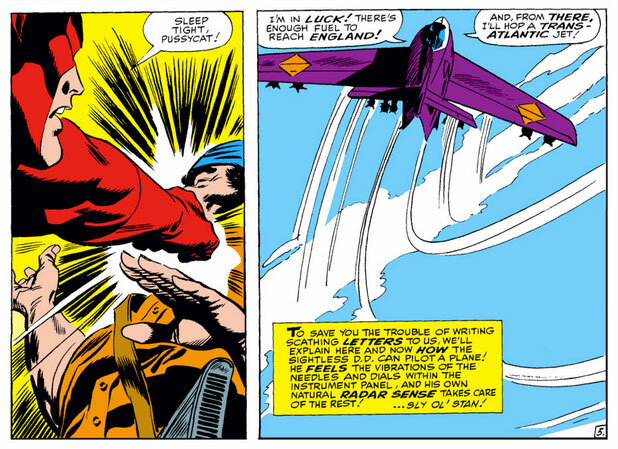 Considering Daredevil’s blindness, the number of times he’s found himself flying some kind of aircraft is pretty astounding. And to be clear, any number higher than zero would count as astounding. In this series, I’ve already covered his landing a rocket (in Daredevil #2, possibly the most craptastic issue of Daredevil ever released), and the time he flew the Avengers’ Quinjet (in Daredevil #100). You might also remember the time Matt staged his own death by having a dummy version of himself “die” in a plane crash, in Daredevil #54. The latter has been touched on in two posts already (Weird moments in Daredevil history and DD (Driving Dangerously)) and entails Matt driving himself to an airfield and then flying off with the dummy in tow. Pretty crazy stuff. But wait! There’s more! In Daredevil #24 (all of these examples are from volume 1, of course…), by Stan Lee and Gene Colan, Daredevil takes to the skies once more. At the beginning of the issue, Daredevil finds himself in an unknown location somewhere in Europe, having been transported there by the Masked Marauder last issue, in the middle of a fight with the Gladiator. After beating up some bad guys who were waving guns in his face, he finds himself in the place depicted in the first panel below. What is interesting here is that Daredevil is displaying a behavior that I, for my own “studies” have come to refer to as CAR, i.e. “Conspicuously Absent Radar.” My definition of CAR is a scene where Daredevil will refer only to sensory information that is auditory, olfactory or tactile in nature, despite being pretty close to the object of interest. This panel is an obvious example. 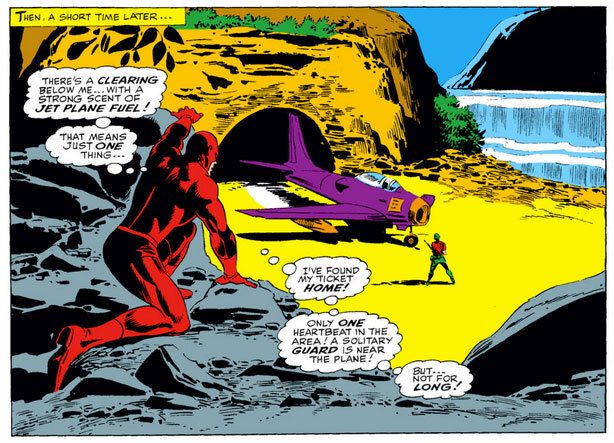 Daredevil appears to be clearly sensing an opening, but he does not appear to be sensing – by radar – the shape or presence of the airplane and its lone crew member, at least not initially, but is instead paying attention only to smell and sound, and putting two and two together. What could be going on here, is that the plane and the figure on the beach are outside of the range of his radar sense. This makes a great deal of sense since Daredevil’s radar sense appears to be understood by most writers as limited in range (which makes physical sense as well). However, the part that makes this “absent radar” particularly conspicuous is what happens on the very same page. Matt’s new power–internal GPS, to match the radar. Wow, that’s pretty amazing, even for Stan the Man. 1), If, as you mentioned Christine, he is in an unknown location somewhere in Europe, how does he know where England is located?? 2) He can ‘feel’ the vibrations of the instruments…..okay, but that doesn’t mean he can tell what those instruments are actually indicating. For example, he may ‘feel’ the altimeter moving, but can he determine the exact altitude that it’s reading?? 3) Good thing Matt is blind so he can’t see the plane he’s flying. A purple fighter jet? Haha. Still, crazy funny. Love it.